Pairing tea and cheese: the example of goat’s cheese Fresh goat’s cheese is one of my favourite cheeses, and I like going to the farm to choose mine. I prefer to accompany it with tea rather than wine. More precisely, a Premium Bao Zhong served at room temperature. To prepare it, first steep the tea for six minutes, then remove the leaves from the pot and leave it to cool for 30 minutes. Serve in small clear liqueur glasses. 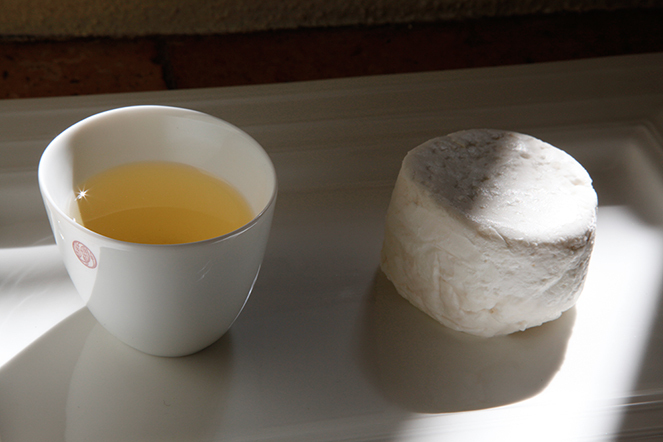 It will make an interesting change for your guests, and you will love the pairing: the tea does not overwhelm the subtle flavour of the cheese; on the contrary, it accompanies it, as the tea’s vegetal and floral notes make way for the milky, delicate animal qualities of the cheese. They make a fine match. I love your passion and the precision and simplicity. A perfect reflection of tea. Steeping Bao Zhong for 6min ? Isnt it too long?